My dear American friends, have you ever been talking about the Great American Pastime, only to have your northern neighbour point out that baseball was a Canadian invention*? Strike back by pointing out that their beloved RCMP owes its invention to the United States. Before the Pikes Peek Gold Rush of 1859, relations between "white" trappers, prospectors and settlers and the "red" nations as generally peaceful, mostly out of enlightened self-interest on the part of the Americans. The Civil War slowed hostilities as the focus of conflict was in the east, but as soon a the war ended, the hostilities ramped up again. Meanwhile, in Canada, the 1860s saw the withdrawal of the Hudson's Bay Company's (HBC) control over what would later become Manitoba, Saskatchewan and Alberta. American trappers and traders took advantage of this to encroach on Canadian territory. The most infamous of these were the wolfers, a gang of 100-300 Americans who had stolen a couple of US Army cannons and set up shop about in a former HBC fort about fifty miles north of the border. Originally designated Fort Hamilton, it was nicknamed Fort Whoop-Up. The wolfers traded whiskey, which was an illegal and potentially lethal brew, and hunted buffalo for the hides. They got their name for poisoning the remaining buffalo carcasses, leaving them for wolves to consume. Then they'd return and harvest the pelts. It didn't matter to them that dogs, and in some cases people, were eating the meat and dying. 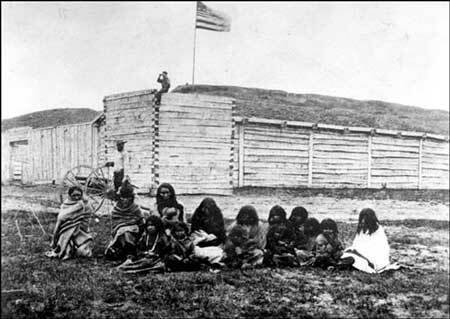 In 1873, a party of wolfers lost their horses at Cypress Hills and blamed a group of Nakoda (Assiniboine) camped nearby. They retaliated, massacring the Nakoda men, women and children. The news outraged eastern Canadians. Prime Minister MacDonald had already received approval to form a military company to police the Canadian west and facilitate treaty making. Cypress Hills sped up the process. Recruitment and training of the North West Mounted Police started, followed by the arduous trek west. 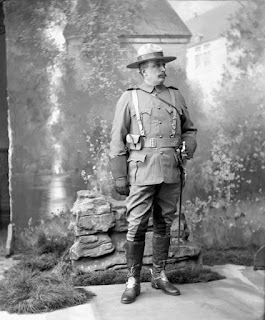 Just over a year after the massacre, Division B under the command of Superintendent James Morrow Walsh reached the site. Walsh's mandate was to stop the whiskey trade and bring the wolfers to justice. Easier said than done. By the time they reached Fort Whoop-Up, the illicit alcohol had been cleaned out. Bringing the men responsible for the massacre to justice was even more frustrating. Arrests were made, but no convictions. In the American courts, killing Indians wasn't considered a crime. In Canada, the cases were dismissed for insufficient evidence. Walsh prevailed, however. It took time, but he cleared out the whiskey traders and gained the respect of the plains nations for upholding the law equally. This reputation which was met with skepticism by Chief Sitting Bull when he sought refuge in Canada. Accompanied by six men, Walsh paid Sitting Bull a visit at his 1,000-warrior encampment. He told the chief that he was welcome to stay as long as he wanted in Canada, so long as he obeyed the law. Sitting Bull laughed at the notion that one man with six followers would tell a mighty chief what to do. Regardless, Sitting Bull stayed in Canada for four years, during which he and Walsh developed a strong mutual respect. 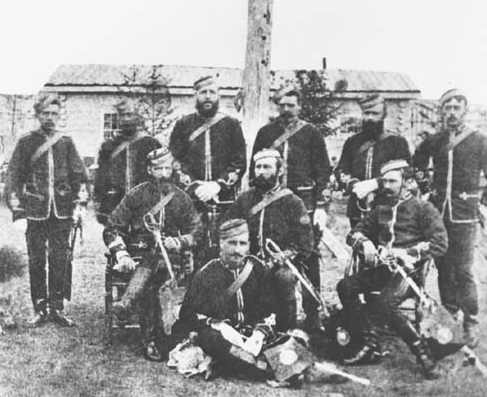 The NWMP were not meant to be a permanent force. Once the prairies were peacefully settled and Canadian sovereignty secured, they would no longer be needed. 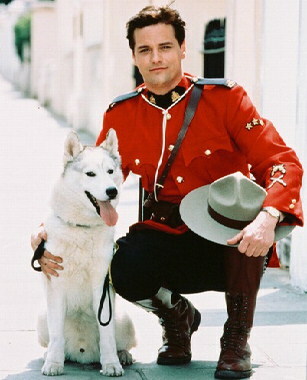 It could be said that Americans save the mounties from that fate. 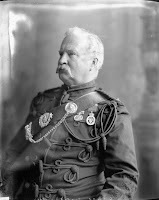 Bringing order to the Gold Rush, in particular the American prospectors, gave Sam Steele adding to the Mountie legend. Steele was one of the first recruits to the NWMP and, like many of his fellows, he already had military training. Many more recruits were farm boys and tradesmen looking for adventure. Steele's talent for training horses and men was put to use very early in his career. He was one of the six constables that accompanied Walsh to treat with Sitting Bull. His intelligence, thoroughness and force of personality ensured that he continued to get choice assignments, including commanding the customs station at Bennett, where the bulk of the rush passed from Alaska into Canada. Like Walsh, Steele was able to levy his force of personality to keep the peace with a relatively small police force, establishing the reputation of "One job. One Mountie." Sgt Preston featured in radio and TV shows. 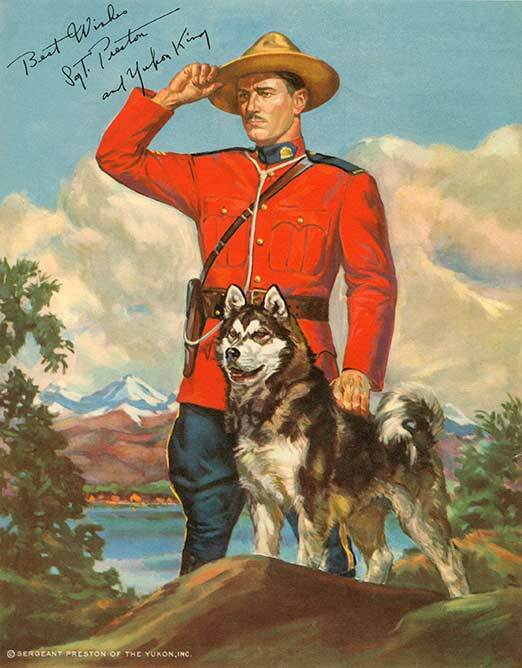 The Mountie is an internationally known Canadian icon thanks, partly if not mostly, to American pop culture. Hollywood was so in love with the Canadian Mountie, the RCMP eventually started sending advisers to oversee their portrayal. My favourite portrayal of a man in red serge is Benton Fraser of Due South. Constable Fraser both embodies and pokes fun of the image of Canada and the RCMP. Fraser has the best traits of Sam Steele, without the 19th century prejudices. *Whether the Beachville (Ontario, 1838) or the Cooperstown (New York, 1839) games were really baseball can be argued 'til the cows come home. As Wikipedia and the American Congress agree, "the modern professional major leagues, that began in the 1870s, developed directly from amateur urban clubs of the 1840s and 1850s, not from the pastures of small towns such as Cooperstown." While researching history, I've turned again to my wonderful "America's Fascinating Indian Heritage" published by Reader's Digest. I cannot tell you how many times I have counted on this historical guide to help me get my facts straight...and to learn. In 1881, Sitting Bull and his Sioux tribe surrendered to the U.S., closing the history of the plains Indians as we know it. All plains Indians were confined to reservations in the Dakotas, to lands so dry and unyielding, that even experienced farmer's would encounter problems working the soil. The people were expected to survive on supplies rationed by the government to supplement what they grew, but sadly, the food they received was as scarce as the yield they garnered from the tilled soil. Land-hungry white men took advantage of the starving Indians and tried to buy their plots for as little as 50 cents per acre, and certain government agencies pressured the red man to consent to sell off the excess real estate. Caught in the middle of greed and hunger, the tribe sustained themselves with memories of the old days. Far away, a Paiute prophet, Wavoka had a vision that spread and gave a new hope to the desparity. The Ghost Dance would bring a new dawn and a time when the white man would disappear. The dead would be resurrected and all Indian existence would change, living forever and hunting the new herds of buffalo that would reappear. In preparation, The Ghost Dance had to be performed, a simple ceremony consisting of dancing and chanting, often resulting in a frenzy where participants often fell into a semi-conscious state and saw visions of the coming of the new world. A Ghost Dance shirt, thought to make the wearer safe from the white man's bullets, was adopted, and because so many wore such shirts, the garments may have been the reason the ritual was considered a war dance. Despite mistreatment at the hands of the whites and the undertones of the Dance, no antiwhite feelings were expressed and the message of the cult was one of peace, but fear mongering among the white officials on the reservation and spreading of gossip pointed a finger at Sitting Bull, who was thought to be the focus of the ceremony. Forty-three Indian police were ordered to arrest him, and descended upon his cabin. He fought against the injustice due to what has been said to be taunts from old women to resist the whites once again. Shots were fired and at the end, fourteen people, including Sitting Bull lay dead. More next month of the aftermath known as the Slaughter at Wounded Knee. Note from Ginger: All information pertaining to the Ghost Dance is attributed to Reader's Digest. I have paraphrased to share this event with you. "Unsurprisingly, the American "Wild West" was tamed by nothing other than the gun"
This month I thought I would take a look at some of the guns found in the "Wild West". used by John Wilkes Booth in the Abraham Lincoln Assassination. 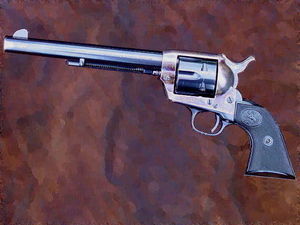 A deringer is generally the smallest usable handgun of a given calibre. They were frequently used by women, because they were easily concealable in a purse, a muff or, in their stockings. Derringers are not repeating firearms, this would have added significant bulk to the gun, defeating the purpose of easy concealment. The original cartridge derringers held only a single round, usually a pinfire or rimfire .40 calibre cartridge, with the barrel pivoted sideways on the frame to allow access to the breech for reloading. The famous Remington derringer design doubled the capacity, while maintaining the compact size, by adding a second barrel on top of the first and pivoting the barrels upwards to reload. Each barrel then held one round, and a cam on the hammer alternated between top and bottom barrels. The Remington derringer was .41 short calibre and achieved wide popularity. The .41 Short bullet moved very slowly, at about 425 feet per second. It could be seen in flight, but at very close range, such as at a casino or saloon card table, it could easily kill. The Remington derringer was sold from 1866 to 1935. Commonly known as the "Peacemaker." Large numbers of look-alikes have never been able to replace the real Colt. Records on the SAA Revolver are a Who's Who of action-oriented Americans of the late 19th and early 20th centuries including Buffalo Bill Cody, Theodore Roosevelt, Judge Roy Bean, Pawnee Bill Lilly, Captain Jack Crawford, Pat Garrett and General George Patton. How about a gun that won't fit in your pocket or a holster? In 1857, the Burnside carbine won a competition at West Point against 17 other carbine designs. In spite of this, few of the carbines were immediately ordered by the government, but this changed with the outbreak of the Civil War, when over 55,000 were ordered for use by Union cavalrymen. This made it the third most popular carbine of the Civil War; only the Sharps Carbine and the Spencer Carbine were more widely used. They saw action in all theatres of the war. There were so many in service that many were captured and used by Confederates. A common complaint by users was that the unusually shaped cartridge sometimes became stuck in the breech after firing. 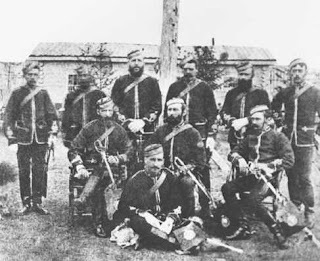 By using ordnance returns and ammunition requisitions, it has been estimated that 43 Union cavalry regiments were using the Burnside carbine during the 1863-1864 period. Additionally, 7 Confederate cavalry units were at least partially armed with the weapon during this same period. Five different models were produced. Toward the end of the Civil War, production was discontinued when the Burnside Rifle Company was given a contract to make Spencer carbines instead. There are many more guns which were used. These are only a very small sample. 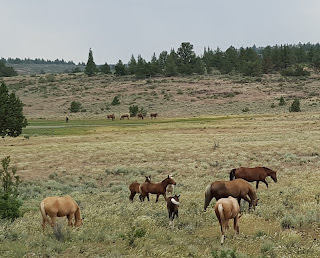 On a recent trip to the Steens Mountain my husband and I had the pleasure of seeing and photographing a herd of wild horses at a drinking hole. I’m not sure if any of them were Kiger Mustangs. We didn’t get close enough to see their distinctive markings, but there were some dun colors in the mix. The Steens Mountains are one of the few places the Kiger Mustang is still in the wild. It is also the place where the breed was discovered in 1977. 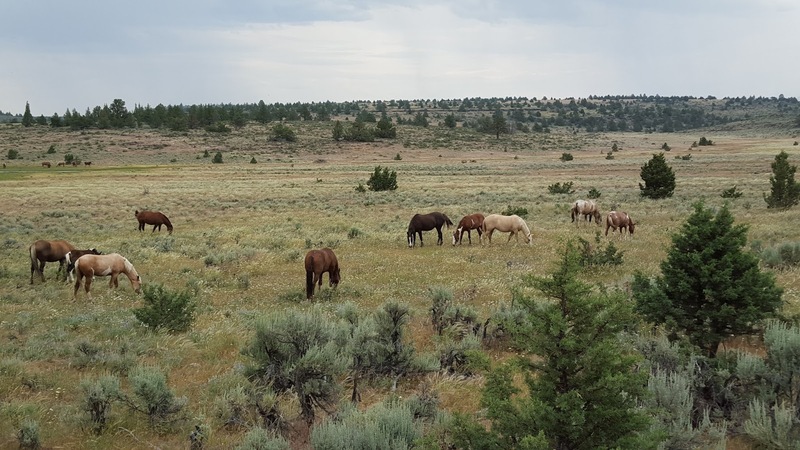 The Bureau of Land Management began rounding up wild horses in Harney County in 1971, but it wasn’t until 1977 when they did a round up at Beattys Butte that they discovered a herd of horses with similar color and markings. DNA testing was done and they discovered the mustangs bore a close relationship to the Spanish horses brought to America in the 16oos. They separated these horses from the other wild horses, split them into two groups and placed them in separate areas of the Steens Mountains. Today they are flourishing and are some of the most prized horses when the BLM does a roundup and auction. Most would say a Kiger had a “dun”colored coat. In truth they come in a variety of colors— grulla(mouse gray), red, and buckskin with a variation of these colors. Other characteristics are: dorsal stripes, zebra stripes on their lower legs, chest, rib, and arm bars, outlined ears, the top one0third of the ear on the backside is darker than the body color, fawn coloring on the inside of the ears, bi-colored mane and tail, face masks and cob-webbing on the face. The less white they have on their bodies the stronger the dun coloring. A horse may have many of these traits but not all of them. They have both the tarpan and oriental hotblood horses that were in the original Spanish Mustangs. Their bones are small and round, with small feet and hardly any feather on their legs and fetlocks. They have wide set prominent eyes, distinctly hooked ear tips, and fine muzzles. They stand 13.2 to 15.2 hands (54 to 62 inches) high. They were the perfect horse for the early American settlers living and working in the west because the Kiger is agile and intelligent with stamina and sure-footedness. They are compact, well-muscled with deep chests, and short backs. While being bold they are also gentle and calm. The Spanish mustang played a large part in helping the American west grow as well as a means of travel for the Native American. 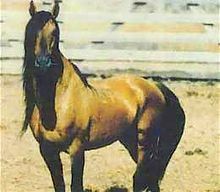 The Kiger mustang is the closest remaining horse to the Spanish mustang. That is why The BLM and breeders of Kigers have made keeping the breed from extinction their goal. 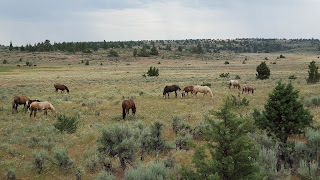 Another photo of the wild horses. Have you ever wondered how people did it in the old days? How did they store food to keep things good long enough to eat? How did they cook? In this day and age, we are all spoiled with refrigerators and freezers to keep our food cold or frozen and stoves and ovens or microwaves and grills to cook our food. What do you think it would be like to live on and run your own farm providing for your daily living essentials? The basis of food was pretty similar in the 1800's to what it is now, only the preservation and preparation have changed with time. Today our meals are planned around the family’s schedule, but it didn't work that way two hundred years ago. In fact, two hundred years ago, families planned their schedule around meals! 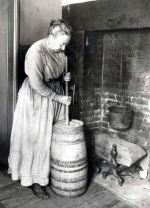 During the early 1800s, cooking dominated the time and energy of the average housewife. There were no big grocery stores where families could go to purchase food, and eating out was truly a rare treat, usually possible only when traveling. Most fruits and vegetables were grown on the farmstead, and families processed meats such as poultry, beef, and pork along with wild game. People were basically forced into seasonal diets. In the spring and summer months, they ate many more fruits and vegetables than they did in the fall and winter. During those colder seasons, families found ways to preserve their food. 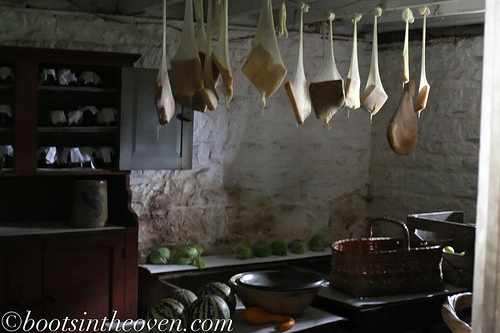 Often vegetables were preserved by stringing them up to hang by the fireplace or in another warm, dry area to remove moisture. To prepare the vegetables for eating, people would soak them in water for a while. Beans prepared in this way were called “leather britches” because of their toughness after drying. Fruits, pumpkin, squash, and other foods could be kept in this way for months at a time. 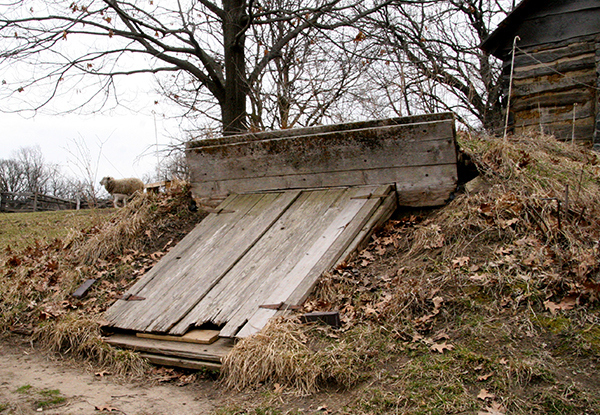 Most homesteads years ago had a root cellar, where families kept food in a cool, dry environment. They stored apples and other foods in piles of sawdust or in containers filled with sawdust or similar loose material. People would dig a pit that was lined with sawdust or straw, place the items in the pit, and cover it with more sawdust or straw. Finally, they would place boards, tin, or a similar material on top. 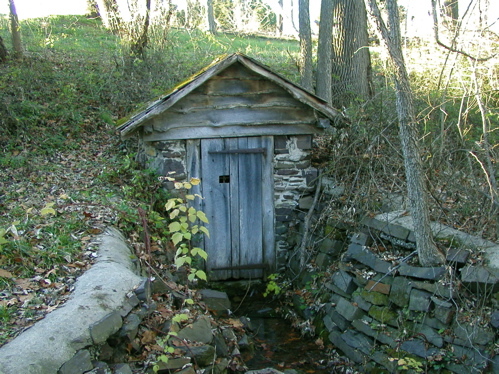 Before refrigerators, the spring house was a fixture around some homesteads, providing a place to keep milk, butter, and other perishables from spoiling. Running spring water kept temperatures cool enough to preserve foods even on hot summer days. 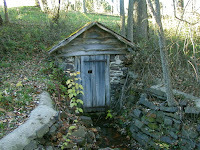 The “house” was a wooden structure with a roof built directly over the spring. It protected the food from animals and severe weather. In earlier days, people simply kept foods down in the water itself. Items like butter also might be kept down a well. By the mid-1800s, a method of refrigeration had taken shape that seems rather crude when compared with today. People would dig ice houses into dirt banks in areas deprived of sunlight, line them with sawdust, and fill them with blocks of ice cut from frozen rivers and creeks. With proper care, the ice would last until summer. The three main ways of curing (the process of preserving food) during this time period included drying, smoking, and salting. Each method drew moisture out of foods to prevent spoiling. Fruits and vegetables could be dried by being placed out in the sun or near a heat source. Meat products could be preserved through salting or smoking. A salt cure involved rubbing salt into the meat, which was then completely covered in salt and placed in a cool area for at least twenty-eight days. During this time, more salt was constantly added. When the meat was no longer damp, it was washed, then shelved or bagged and left to age. 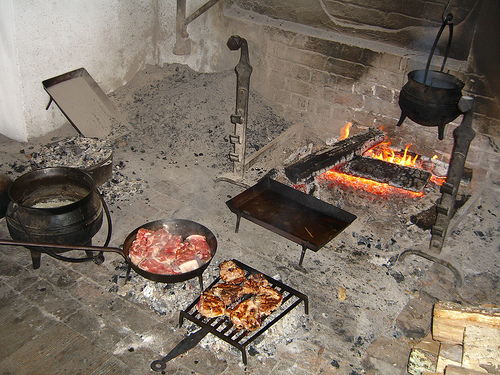 Families would hang meat preserved through a smoke cure in rooms or buildings with fire pits. For a month, the meat was constantly exposed to smoke, which dried it out while adding flavor. Using different kinds of wood for the fire, such as hickory or oak, could produce different tastes. A typical day on the farm would begin very early. Women built the fire based on the meals planned for that day. 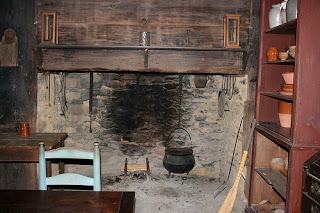 The kitchen often was hot, smoky, and smelly and the hearth provided the center of home life and family activity. With no ovens or electricity, women prepared meals on the hearths of brick fireplaces. They used different types of fires and flames to prepare different types of food. For example, a controllable fire was used to roast and toast, while boiling and stewing required a smaller flame. A big difference between the way people eat today compared with long ago is the work and time needed. Two hundred years ago, food and food preparation stood at the center of the family’s daily lifestyle. Without the advances in technology that help us store, preserve, and prepare food, men and women would spend much of their time getting meals ready to eat. Sounds tiring doesn't it? Or refreshing, rewarding? I was intrigued at once and wanted to learn more. Now, I’m pleased to share with you the story of this remarkable man and his ministry. Born in 1891, Ralph Hall grew up in a remote area in west Texas. One day a traveling minister knocked on the family’s door, and the boy knew then what his mission in life would be. At the age of eighteen, and with only a fifth-grade education, he left home to be a lay missionary for the Presbyterian faith. 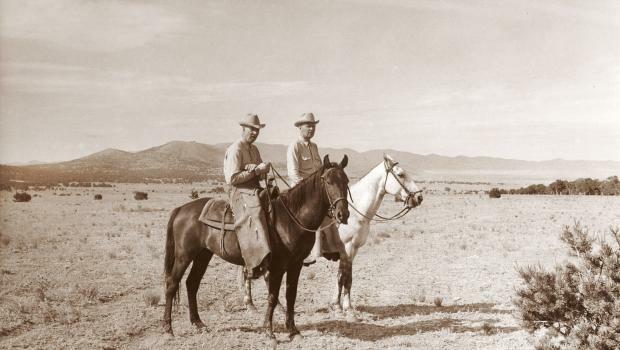 His first official assignment was with the cowboys and ranchers of Texas and New Mexico. At that time, Hall wasn’t ordained to offer communion services, nor could he baptize, so he was accompanied by Dr. Houston Lowery, a minister from Carlsbad, New Mexico. Dr. Lowery soon found himself a bit disoriented with no pulpit, no choir, no pews. He quickly realized, however, that young Ralph Hall was a gifted speaker, one who knew the people and understood their hearts. 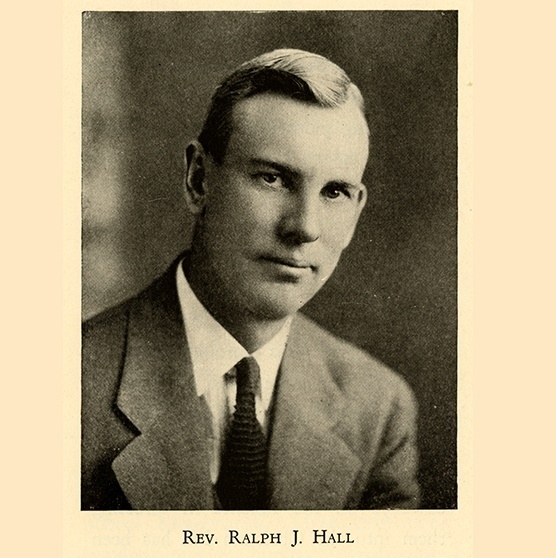 In 1916, after only two days of instruction and examination, Ralph Hall was ordained. Throughout his life in the ministry, he gained respect from the people he served because of his willingness to work alongside of them, helping with the roping and ranching. He traveled extensively throughout the southwest, and under his supervision, many conference grounds, camps, church schools and chapels were constructed. Whenever he arrived in a new town, his first job was to figure out how to build rapport with the cowboys and ranchers in the area. 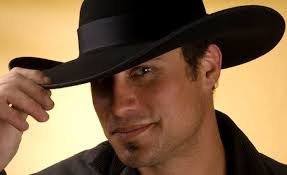 Many of them, he said, “had a scowl rather than a welcome for the preacher when he came around,” so Hall wouldn’t let on that he was a minister until the men had accepted him as a “real cowboy”. Folks said Hall could “rope a steer in record time” and “read trail signs like an Indian”, skills that quickly won over the men he worked with. 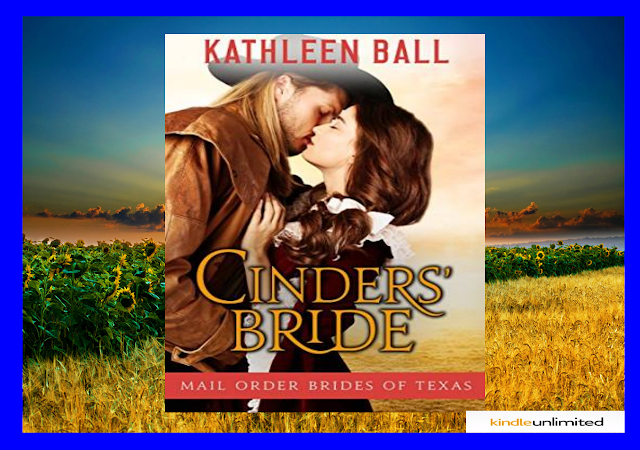 Later, having gained acceptance and trust, he would open up to the cowboys about his faith, usually late at night as they sat near a roaring fire. Even the most skeptical of the men would listen. As the story of his missionary work with the cowboys made its way back East, many curious folks wanted to join him for a taste of the “cowboy experience.” Those who did accompany Hall on his journeys found out that the cowboy’s life was not an easy one. 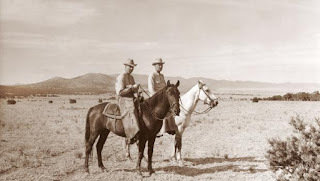 Most were unprepared for the grueling 18-hour work days, the roping, the riding, and the difficulties of tending to cattle over treacherous terrain and erratic weather. Hall was comfortable riding long distances and preferred to sleep out under the stars. His eastern-born friends often found themselves jettisoning their over-packed bags at the side of the trail and leaving their bedrolls behind while they scurried off to find shelter on cold desert nights. According to the Presbyterian Historical Society, Ralph Hall went on to supervise all Sunday School missionary work west of the Mississippi River, traveling hundreds of miles to remote ranches to perform baptisms and marriages. He brought church to the homes of many pioneer families who were hundreds of miles from the nearest towns. He was also instrumental in developing the idea of “camp meetings” in order to find ways to bring people together for worship. 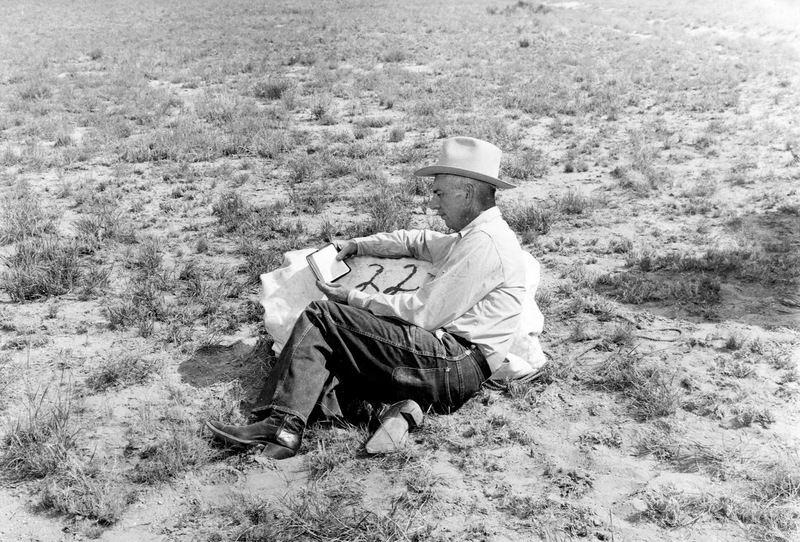 Although he relied on word of mouth to promote the first Ranchman’s Camp Meeting, hundreds of people came together at Nogal Mesa – a beautiful pine-covered mountain near Carrizozo, new Mexico – to hear the word from guest preachers, to read and study scriptures, to pray together, and to partake of meals cooked over a fire. The Ranchman’s Camp Meeting still meets annually at Nogal Mesa. In addition to becoming the subject of several documentaries filmed between 1920 and 1950, he shared the story of his life and his mission in The Main Trail, published in 1973. I’m glad I got to know Ralph Hall’s story. His devotion is inspiring. I hope you’ve enjoyed learning about this “cowboy missionary” and his dedication to serve others. A while back, I struggled to describe what a hairpin from the early 1900s would look like in a scene in my latest Pendleton Petticoats book. I perused the pages of my reproduction 1897 Sears and Roebuck, Co. Catalog, but the drawing wasn't clear enough to provide an accurate picture and the description lacked detail. Fast forward a few days to a book signing I did at a two-day vendor event. The first day, I didn't have the opportunity to wander around and look at the other booths. Since many of them had vintage treasures galore, it was about to drive me nuts. The second day was equally busy, but toward the end of the afternoon, I darted around to a few booths. I stopped at one to admire some beautiful tablecloths from the 1940s and happened to glance down at a little display tucked between hideous ceramic figurines from the 1960s and a selection of children's books. Although the box originally held a dozen, there are eight total. Some are thick and wide, some are thin and narrow. I have no idea on the sizing difference. The vendor said she bought a whole collection of hair items from a retired beautician. 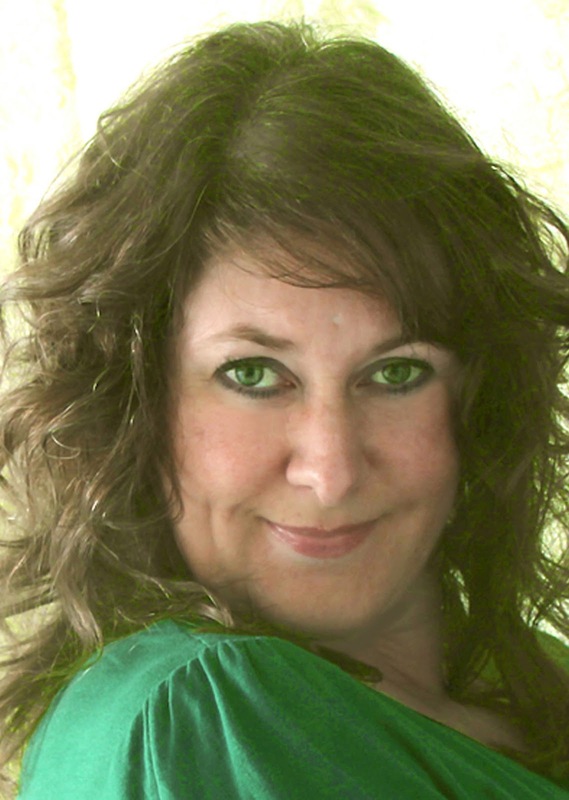 She thought the hairpins were from the late 1800s or early 1900s - right in the time frame I needed for my book. If any of you have any details on this type of hairpin, I'd love to hear more about them. with complete directions on how to use. First place the curler under strand of hair close to head. Twist end of the curler around strand of hair to fasten. Now coil hair around the curler with a twist, letting each coil touch. Bend end over, dampen hair lightly after it is done up. From half hour to one and one-half hours will produce a beautiful wave. For Bobbed Hair - Double curler in center, place ends of hair between curler, roll up or down the way you want the hair to curl. Bend both ends. There were also two leather-covered curlers included with the ad. Wires inside make them very flexible - perfect for creating those old-fashioned curls. Although I haven't been inspired to try the curlers yet, I'm so happy I found these vintage treasures! 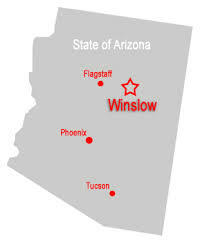 Long before Flagstaff and Sedona became popular vacation towns in Arizona, everyone visited Winslow and the La Posada Hotel for special occasions. Built in 1929 by the Santa Fe Railway, it was the work of esteemed architect Mary Jane Colter, known for the design of many structures at the Grand Canyon. La Posada, however, was her masterpiece and favorite project. La Posada is one of the last of a series of hotel-depot complexes built across the Southwestern United States in a collaboration between Fred Harvey and the Atchison, Topeka and Santa Fe Railway. Designed for a railroad traveling public, the original front door faced the tracks to the south. It was thought that most guests would arrive by train and stay for several days, so day tours to the Petrified Forest and Indian sites were made available. For a fee you could get a driver, a guide, a picnic, and a custom Packard or Cadillac touring car. Colter chose two patron saints for La Posada—San Pasqual, Patron Saint of Feasts, and San Ysidro, Patron of Farmers. La Posada was officially a Harvey House. Usually, Harvey Girls had a distinct uniform—black dresses with white aprons. But Mary Jane Colter felt the uniform was too severe for La Posada so she substituted colorful aprons with green, blue, or red backgrounds, quilted cacti, donkeys, and snoozing, big-hatted ranch hands. La Posada was the only Harvey Hotel allowed a non-standard uniform. The kitchens of La Posada were the finest in the Four Corners region. It wasn’t unusual in the 1930’s and 1940’s for hotel to serve 1000 meals a day. In addition to the main kitchen, there was a full bakery and butcher shop, store rooms and freezers, china and linen rooms, and a lead-lined walk-in humidor for cigars. They even refrigerated the kitchen trash to keep it from smelling. Most halls ran north-south to capture prevailing winds, and guest doors were louvered to create convection currents. A wind tower exists to capture warm air as it blows in from the southwest across watered lawns, where it’s cooled, humidified, and pushed through public spaces in the hotel. Colter filled La Posada with such passive solar details to keep the hotel comfortable during Arizona’s hot summers. Famous people who’ve visited include Howard Hughes (Winslow was a TWA stop and he owned the airline), and Charles Lindbergh and Anne Morrow, who resided during part of their honeymoon. They also stayed while Lindbergh designed Winslow’s airfield (the world’s only surviving Lindbergh-designed airport). Other famous guests: Albert Einstein, Will Rogers and Diane Keaton. Added to the list of visitors - me! On my recent vacation, it was fun to buy a few potential research books that might come in handy for future historical western romances. From famous mountain men, to Indians, and Prostitution and women in medicine in the 1800’s, these books make for some interesting reading, regardless if I use any of the information contained within or not. One such book was filled with “granny medicines,” or medicine used during the time. Among the many chores women were charged with on the wagon trains, they were also responsible for the overall health of their family members. 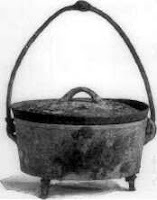 Their supplies contained not only ingredients for cooking supper, but also herbs and journals handed down through the generations with home remedies. Items such as juniper berries, garlic, and bitter root were used to treat anything from nausea to typhoid. These remedies were usually a combination of advice passed down through the generations, to superstition, to religious beliefs. 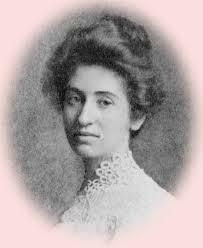 Advise such as “rinse your mouth each morning with urine to preserve your teeth and prevent mouth odor,” or “mold scraped from cheese will heal open sores,” to “wrap a piece of bacon sprinkled in black pepper around your neck to cure a sore throat,” was common. Some medicines, such as poultices or teas might have brought some relief, but most often they were of no use, and at worst, did more harm than good. - Mashed snails and earthworms in water are good for dyptheria.